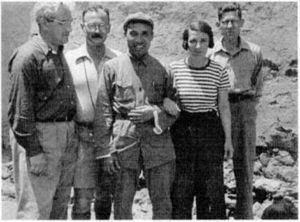 Philip Jaffe, Owen Lattimore, Chu Teh, Agnes Jaffe, and Thomas Bisson in Yenan, China, June 1937. Thomas Arthur Bisson was an Asia specialist working in the World War II Board of Economic Warfare (BEW) and later the Institute of Pacific Relations (IPR). He was an American citizen who as a Soviet spy reported to the New York GRU (Soviet Military Intelligence) in 1943. Bisson was a founding editorial board member of Amerasia and China Today. Bisson supplied the GRU in 1943 through Joseph Bernstein confidential BEW reports including a joint British-American evaluation of the military situation on the Soviet-German front, as well as reports on American strength in the China theatre of operations, a report by the Chinese embassy in Washington D.C. on trade between Chinese nationals in Japan and Chinese mainland industrialists, a report by an American consul on conditions in Vladivostok, a report on Chiang Kai-shek's war with the CCP, and internal United States government discussions regarding direct contact with Maoist forces to arrange establishment of air bases in territories fallen under their control. When, on June 15, 1943, Owen Lattimore instructed Joseph Barnes to replace the non-Communist Chinese of the Office of War Information (OWI) with Communists, OWI did so. On July 14 Bisson, in the Institute of Pacific Relations publication, Far Eastern Survey, referred to Moaist forces as the "democratic China." The disinformation was widely repeated among journalists and academics. In July and August 1943, the Chinese Communist forces—in the midst of the war—joined with the Japanese armies to inflict a serious defeat on the Kuomintang troops allied with the United States. Marquis (Joseph Bernstein) has established friendly relations with T.A. Bisson (hereafter Arthur). . . who has recently left BEW; he is now working in the Institute of Pacific Relations (IPR) and in the editorial offices of Marquis’ periodical [Amerasia]. . . Arthur passed to Marquis . . . copies of four documents: (a) his own report for BEW with his views on working out a plan for shipment of American troops to China; (b) a report by the Chinese embassy in Washington to its government in China. . . . (c) a brief BEW report of April 1943 on a general evaluation of the forces of the sides on the Soviet-German front. . . . (d) a report by the American consul in Vladivostok. . ."
In the 1950s, Senator Joseph McCarthy made accusations against Bisson, not knowing the full extent of Bisson's complicity in Soviet espionage. ↑ Venona: Decoding Soviet Espionage in America, John Earl Haynes and Harvey Klehr, Yale University Press, 1999. ↑ The Yalta Betrayal, Felix Wittmer, Claxton Printers, 1953, pg. 36. This page was last modified on 24 June 2016, at 11:51.